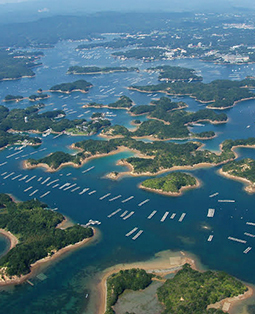 Studded with small bays and inlets, the peninsula known as Ise-Shima­—the venue for the upcoming 2016 G7 Summit in May--is a utopia for those seeking a glimpse of classical Japan, from the expansive environs of the sacred shrine of Ise Jingu to the bounty of the ocean. Swathed in white, the modern-day mermaid dives beneath the surface of the glittering sea, feet together and toes pointed as neatly as any synchronized swimmer. A minute later she breaks the surface, her whistling cry echoing in her wooden bucket as she triumphantly holds her prize aloft—an abalone the size of a hand—before depositing it in her cache and plunging back down to seek more treasures. The coastal area of Ise-Shima is awash with myths and traditions, from the fishing grounds of female free divers called ama to Ise Jingu, one of Japan’s three most revered shrines, said to be home of Amaterasu-Omikami: sun goddess, ruler of the heavens, and the direct ancestor of the Imperial family. Encompassing the cities of Ise, Shima, Toba and part of Minami-Ise, the entirety of Shima Peninsula is a national park located at the southeastern end of Mie Prefecture. The region is a stunning exemplar of rural Japan, rich with the bounty of the Pacific Ocean, fantastic folklore and breathtaking natural scenery. It’s no wonder the area has been chosen to host the 2016 G7 Summit this coming May. Ise Jingu, located in Ise City, has a history stretching back to the third century and stands as the head of all Shinto shrines in Japan. The shrine precincts cover 5,500 hectares—or about a quarter of the city’s land—and encompass 125 Shinto shrines collectively referred to as Ise Jingu. When crossing Uji Bridge, it’s said that the visitor leaves the human realm and enters the land of the gods. Visitors flock from near and far to worship here, seeking a chance to commune with the gods that created Japan and imbue every facet of nature. The areas around the shrine have long served shrine-goers in need of respite after a long pilgrimage. The Oharaimachi and Okage Yokocho areas bustle with customers, shops standing cheek by jowl under fluttering noren curtains and handsome ceramic-tiled roofs bearing family crests and other symbols. Vendors in aprons hawk orderly stacks of local products—shellfish, seaweed, pottery, baskets and more are on offer here. 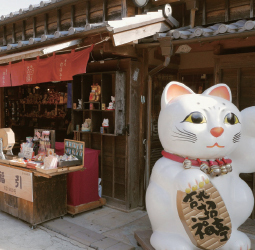 Beckoning mascots such as maneki-neko cat and okage inu dog figurines—the latter based on a dog said to have made a pilgrimage to Ise in place of his master during the Edo Period (1603-1868)—offer a bit of luck you can take home. Here you can get Ise udon—fat, pillowy noodles smothered in a dark sauce made with all-natural dashi soup and a variety of locally made soy sauce called tamari joyu. Terumi Kojima, proprietor of Okage Yokocho’s Fukusuke restaurant, says the dish was invented for travelers wanting a filling and easy-to-consume meal. Those craving something sweet can head down the street to the iconic confectionery shop Akafuku. Famous nationwide, Akafuku has been making its signature mochi and red bean paste concoction for three hundred years. At the Kannamesai, Ise Jingu’s most important festival, 31 types of food and drink (including 16 types of seafood) are offered to the sun goddess. To learn the history of the people that harvested them, you can visit the Toba Sea Folk Museum in nearby Toba City. Museum curator Daizo Hiraga explains that there’s a deep connection between the sea and the people of the region, which is reflected in the sea bounty offered to the gods at the shrine. “A specialty of Mie Prefecture is that you can get just about any kind of seafood here,” says Hiraga. The museum also explores the history of the ama, the characters for which literally mean “sea woman.” Hiraga relates that the recorded history of these intrepid women dates back at least a thousand years, although it’s not clear why ama have tended to be women. Some say it’s because they have a higher body fat percentage and thus don’t get as cold when diving. Hiraga says there’s also a theory that long ago someone related to Ise Jingu decreed that the abalone divers be women, and the tradition held. Whatever the reason, it’s a proud profession that women have dominated for more than a millennium. Collecting all that shellfish sometimes brings a special bonus; ama are also closely associated with pearl diving, since the shellfish they harvest occasionally yield these aquatic gems—though a decently-sized pearl is found in only one of tens of thousands of shellfish. Although the modern method of pearl cultivation means that ama are no longer major players in the pearl industry, you can still see a tribute to the ama’s contribution in the form of an ama performance at Mikimoto Pearl Island. The island, located just off mainland Toba City in Ise Bay, was originally used as a testing ground in the early days of pearl cultivation technology. 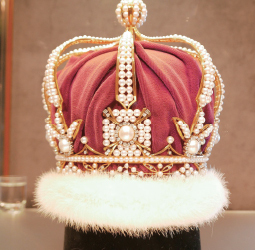 Now it hosts a museum, shop, restaurant and the ama show, all dedicated to the wonders of pearls and the creatures that produce them. 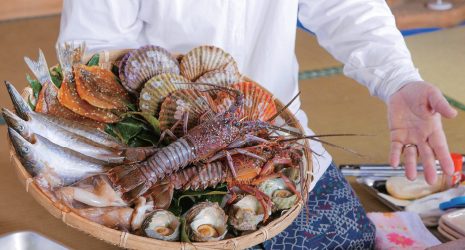 At Satoumian in Shima City, a seaside wooden hut that offers a taste of the ama experience, you can talk to the divers while eating a lunch of freshly grilled seafood. Veteran ama Kimiyo Hayashi, who’s sixty-one, has been diving since she was fifteen. 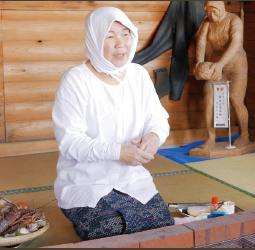 “My grandmother and my mother were ama before me,” she explains as she places just-gathered awabi (abalone), Ise ebi (Ise lobster), and sazae (horned turban shell) on the fire.